There are your average emails - pretty to look at, unassuming, pleasant even - and then there are emails from Boden. The subject of much cooing and adoration here at Ometria HQ, Boden’s customer lifecycle marketing has been dazzling our inbox for some time now and - much like Justin Bieber's mustache - it’s time we got serious about how much we love them. 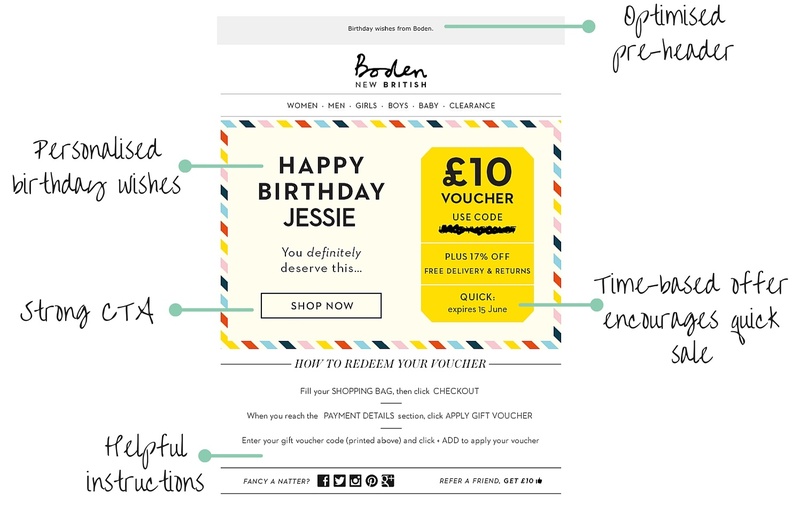 Boden, famous for reinventing catalogue shopping for the style-conscious middle-classes, is sweeping over the globe with its well-to-do British influence, quality and...email design. 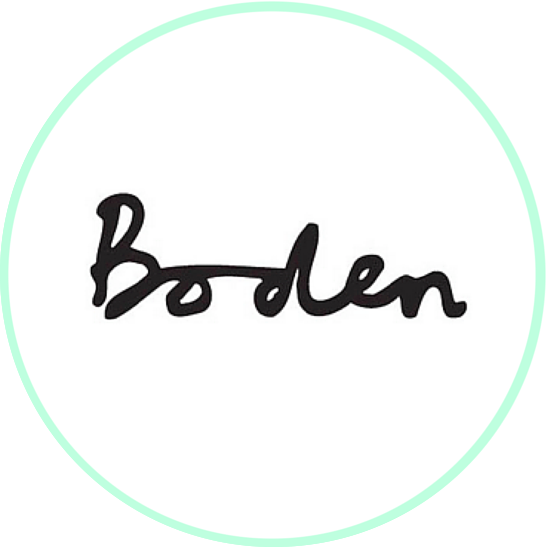 Whether clothing D-Cam, or swaddling the newborns of the aspiring upper crust, Boden’s email marketing is certainly ruling the waves: marrying style, class, image and functionality under one quintessentially brilliant email strategy that's been the apple of our eyes for some time now. Rather than shying away, bashfully disguising our affection under a petticoat of butterflies and sweaty palms, we’re hitting our crush straight between the eyes - love is blind after all. According to Return Path, people that read at least one welcome message read more than 40% of messages from the sending brand during the following 180 days - so it needs to be love at first sight. Boden’s welcome series is cool, calm and collected: a subtle, but firm introductory handshake. Why we love it: a friendly welcome with strong, stylish visuals that set expectations while introducing product breadth - holding off on the immediate sell - classy. 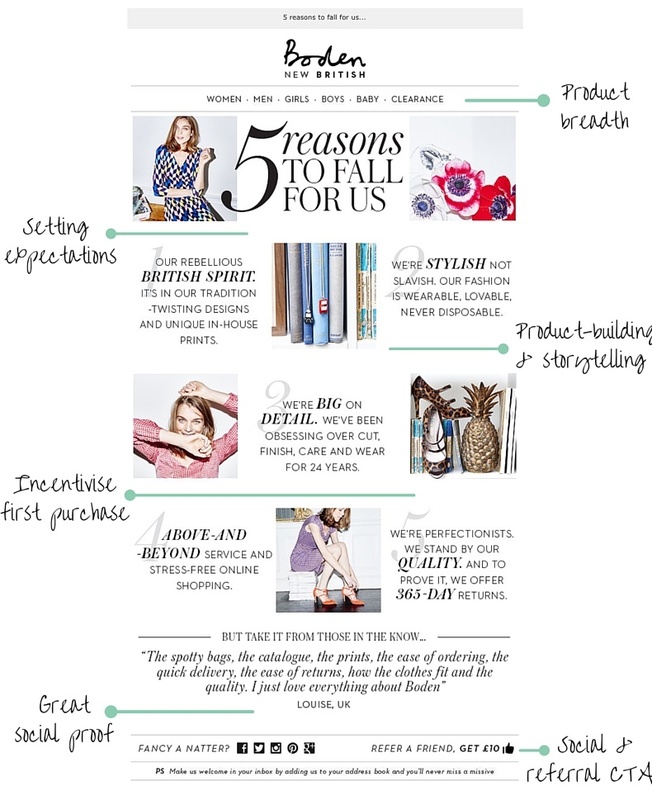 Second in the welcome series, Boden's "5 reasons to fall for us" is a great introduction to the brand story and begins incentivising shopping by highlighting perks and customer feedback. Why we love it: introduces brand story and incentivices first purchase with shopping perks and strong social proof. Upon entering into a relationship, everyone needs to be aware of what they're getting themselves into: "is this brand a bunny boiler? ", common thoughts we all share. Boden does a great job of outlining expectations, paving the way for a strong relationship built on a mutual understanding. Why we love it: apart from a little GIF treat, the "free delivery and returns" shopping incentive builds towards that all important first sale. When a customer has subscribed, but is yet to make their first purchase (and a reasonable window of time has passed) it's wise to start dishing out some incentives to tempt shoppers onto the buy button. This message is highly targeted towards new subscribers who are yet to purchase, using social proof to make weary shoppers confident to buy - alongside discounts - to encourage activity. Social proof has an extraordinary impact on the purchase decision making journey, with 70% of people said to trust consumer opinions posted online, according to Nielsen. Discounts are also a proven 'nudge down the funnel' - with the number of people frequently seeking bargains out online growing from 23% in 2014 to 33% in 2015 (according to VoucherCodes.co.uk). Boden's marriage of the two is a recipe for success: combined with product recommendations, this email is a triple threat, tempting users to buy. Why we love it: discounted shopping incentive combined with a visual introduction to the product via recommendations and some glowing social proof. Because post-purchase transactional emails contain valuable information for customers, they're some of the most widely opened, so provide a unique opportunity to encourage reactivity at the same time as providing a digital proof of purchase. 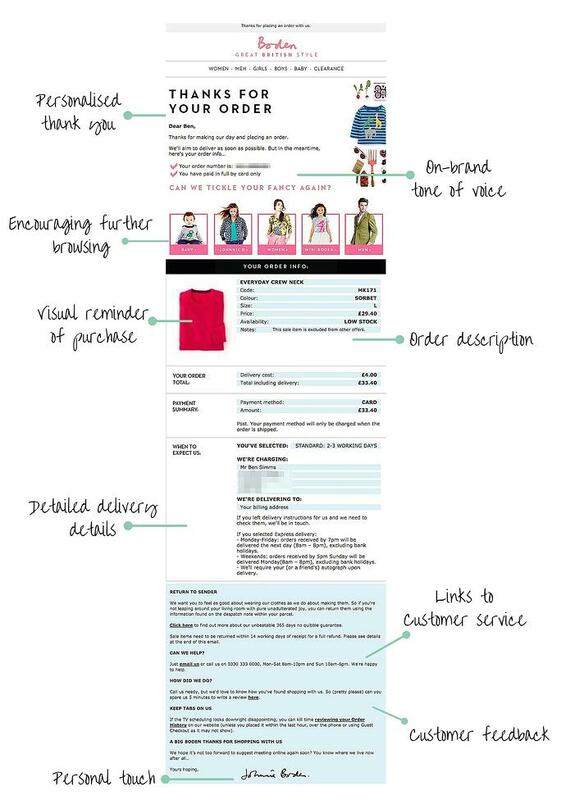 Boden includes a comprehensive list of order details: product, quantity, order number, delivery address, payment details etc, all you would expect from a confirmation, but it's worded so brilliantly and clearly designed (with the user in mind) that a data-heavy message transforms into an extension of brand personality and user experience. 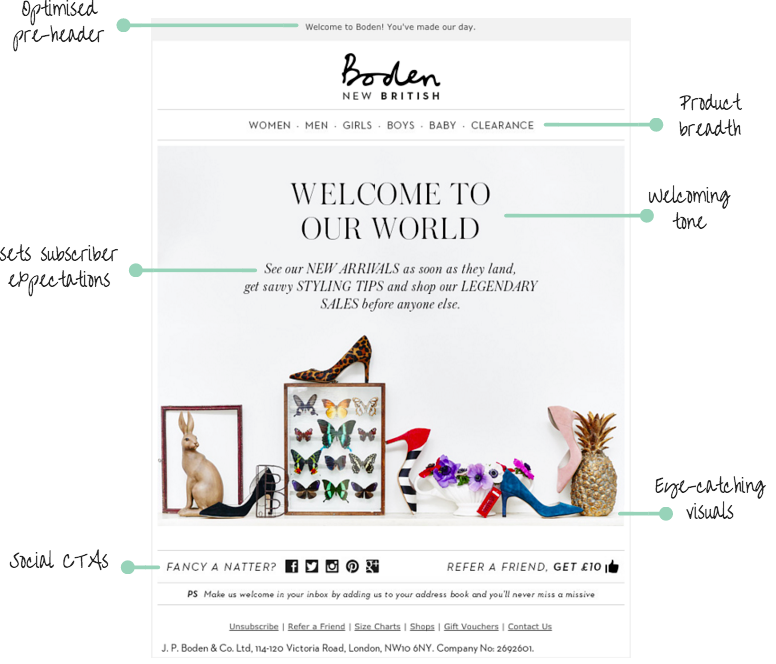 Not wasting an opportunity, Boden encourages on-site activity by displaying product categories at the top of the message. The confirmation also encourages customer feedback - to glean vital shopping experience data - a great way to secure reliable information given that transactional email open rates are eight times higher than marketing emails. Why we love it: a polite, personalised thank you, great copy and product categories encouraging on-site activity all woven together with extensive delivery details and a visual order reminder. A study by Experian of 10,000 birthday and anniversary emails found that personalised birthday emails had almost five times the transaction rate of standard mail-outs. Targeting customers while they're celebrating (with that recent birthday cheque from grandma burning a whole in their wallet) is a lucrative opportunity for online retailers. Similarly, celebrating key milestones such as annual anniversaries is a great excuse to target customers with treats that underline how much you care. Why we love it: Boden's birthday message is a wondergul recognition of brand-customer relations with a strong CTA and a sense of urgency to encourage a sale. Lapsed customers may have gone cold for a whole host of different reasons, it's your job to "show them what they're missing" by spearheading brand personality to remind the customer why they fell in love with you in the first place. According to a study by the Online Publishers Association, of 80% of internet users who watched a video ad, 46% took some sort of action after viewing the ad. GIFs/videos/the moving image is a powerful way to engage users and encourage activity beyond the platform. Why we love it: tone of copy makes light of user inactivity and uses the power of the moving image to grab users attention and move them off email and on-site with a clear CTA. The latest statistics estimate that 42% of marriages in England and Wales end in divorce - the same doesn't have to be true with brand-customer retlations: Boden's found the secret for love longevity. Unlike (true) love, brand loyalty can be bought - one way to win-back lapsing customers is by offering a discount in a last-ditch attempt to rekindle the romance you once shared. A final re-permission opt-in email will also help you to clear your datasets of lapsed customers (and help to encourage activity with your inactive, but loyal customers) to help you better target key segments. Why we love it: running with the consistent imagery, this win-back re-permission email has a clear message and a clear discounted incentive to encourge activity or...divorce. While lifecycle emails still encompass a minority of emails sent by a retailer (with calendar-based, daily, and transactional emails making up the bulk of most email programmes), they are some of the most effective as they speak to customers at specific times with key messaging likely to influence behaviour during periods of heightened engagement. Confused? 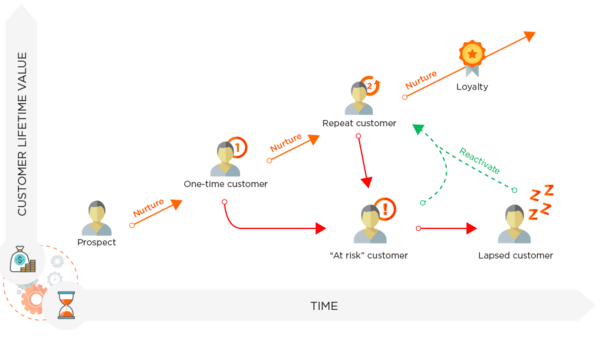 Here’s a diagram of the different stages of the customer lifecycle to make it clearer. Identifying customers throughout their lifecycle - considering solutions to keep them engaged and active - is paramount to ecommerce success. Active, loyal purchasers are the golden ticket - the customers you need if you want to enjoy long-term, sustainable success as an ecommerce business (Mr Pareto agrees). Clever, engineered and consistent lifecycle marketing is the way forward. 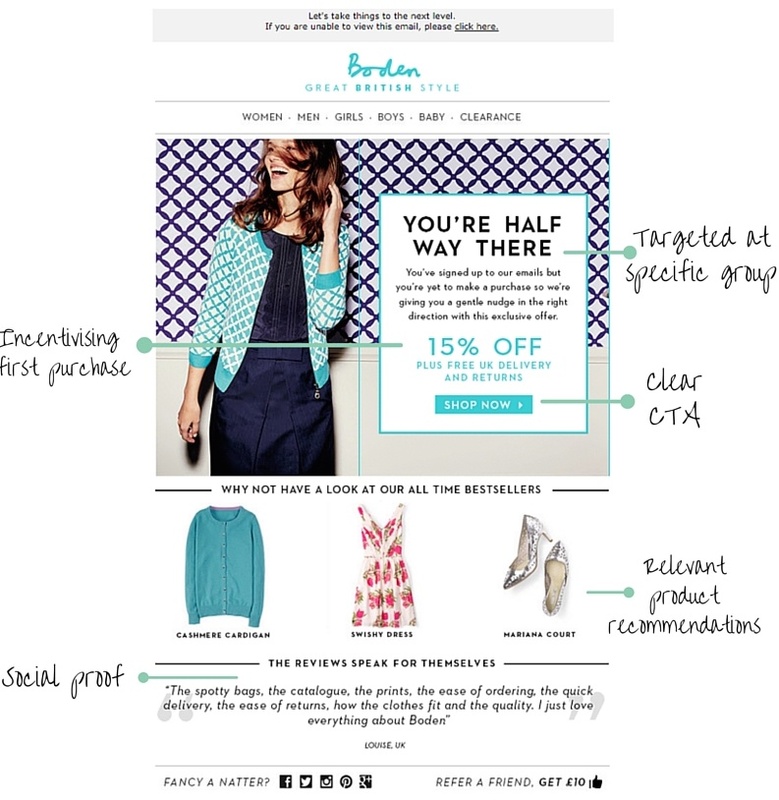 Boden's email lifecycle marketing is a wonder to behold: they know when to send emails at the right time with the right content to trigger activity. Their copy is consistent with a fantastically witty tone that echos its informal and personable brand image - and all of their emails display product breadth alongside clear CTA's - a perfect remedy for lifetime happiness. 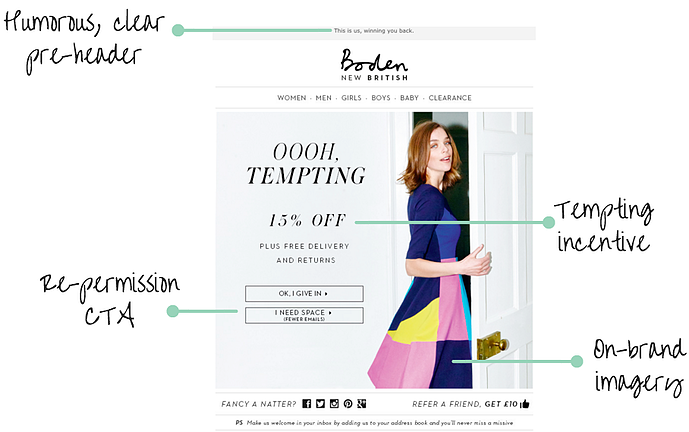 Is Boden's email lifecycle marketing the elixir of customer retention? We think it might be.